Are you (or your son/daughter or grandchild, etc.) currently a student with an .edu email address? Sign up for a FREE 6-month trial of Amazon Student, and then you can can get $15 off a $40 purchase when you enter promo code PRIMESTUDENT at checkout. Offer expires on 4/16/17, so you would really want to get this done asap. Select at least $40 in products (but not digital content) sold by Amazon.com or Amazon Digital Services LLC, not sold by a third-party seller or other Amazon entity (look for "sold by Amazon.com" or “sold by Amazon Digital Services LLC” on the product detail page), and place the products in your Shopping Cart. Enter the code “PRIMESTUDENT” at checkout in the “Add a gift card or promotion code” field. The $15 discount will then be applied. As a Prime Student member, you receive a 6-month trial that includes FREE Two-Day Shipping on eligible purchases. You’ll also receive unlimited streaming of thousands of movies and TV shows through Prime Video, access to unlimited photo storage through Prime Photos, as well as Student-exclusive deals and discounts. 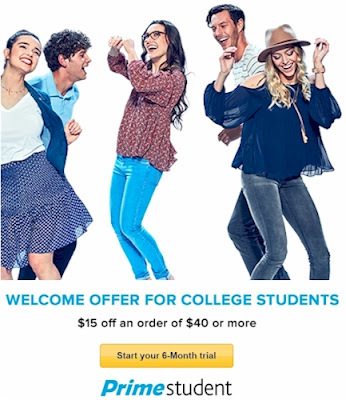 After your 6-month trial ends, your Prime Student membership makes you eligible to receive 50% off Amazon Prime, including all Prime benefits (including music), for four years or until you graduate, whichever comes first.